This year's display of Leonid meteors peaks on November 17th, but they'll be largely washed out thanks to strong interference from the Moon. 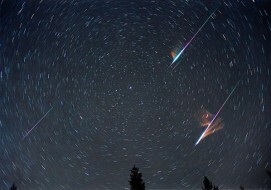 Leonids are well known for their fireballs. 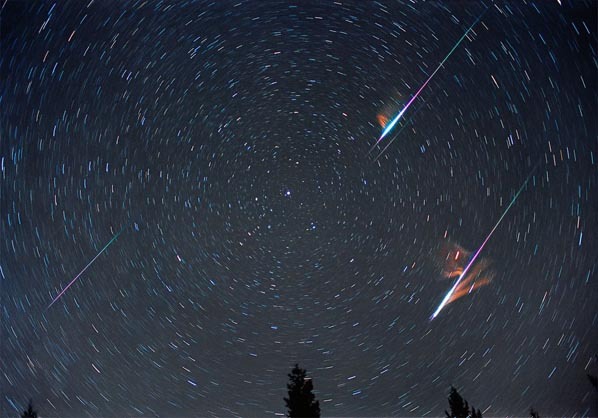 Tony Hallas captured two in a single frame during the 2001 Leonid shower. Each also left a persistent, glowing train. There was a time, especially in the span from 1998 to 2001, when mid-November's Leonid meteor shower was truly a "must see" celestial event. Back then torrents of dust particles released by the shower's parent comet,Comet 55P/Tempel-Tuttle, flashed across the predawn sky and wowed observers. But lately the Leonids have been far more modest, delivering 10 to 15 meteors per hour during its relatively brief peak. And even this dribble of "shooting stars" will be compromised during the shower's peak, around 11hUniversal Time on the 17th, which comes just three days after a very full Moon. Its fat, gibbous disk, perched under the feet of Gemini, will likely wash out all but the brightest Leonids. But if you're out and about late on the 16th or 17th, and the sky is clear, you might as well look, right? 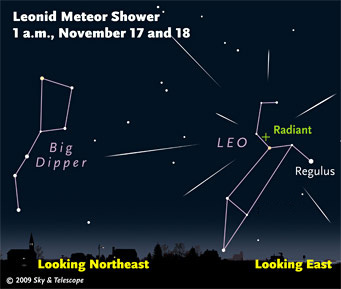 The shower's radiant, near the Sickle asterism in the head of Leo, the Lion, rises in the northeast between 11 p.m. and midnight, by which time the Moon will already be well up in the sky. The direction to watch is wherever your sky is darkest, and it will certainly help to pick a spot where the Moon is blocked from your view by a building or tree. Notice the meteors' flight paths; only those streaking away from the direction to the constellation Leo are Leonids. They're incredibly fast-movers as meteors go, striking Earth's atmosphere at 71 km per second (160,000 mph). Sometimes they create dazzling fireballs with an afterglow (technically known as a train) that can linger as a ghostly thread in the sky for up to a minute.